PSALMS 18:3 KJV "I will call upon the LORD, [who is worthy] to be praised: so shall I be saved from mine enemies." 1(To the chief Musician, A Psalm of David, the servant of the LORD, who spake unto the LORD the words of this song in the day that the LORD delivered him from the hand of all his enemies, and from the hand of Saul: And he said,) I will love thee, O LORD, my strength. 2The LORD is my rock, and my fortress, and my deliverer; my God, my strength, in whom I will trust; my buckler, and the horn of my salvation, and my high tower. 3I will call upon the LORD, who is worthy to be praised: so shall I be saved from mine enemies. 4The sorrows of death compassed me, and the floods of ungodly men made me afraid. 5The sorrows of hell compassed me about: the snares of death prevented me. 6In my distress I called upon the LORD, and cried unto my God: he heard my voice out of his temple, and my cry came before him, even into his ears. I will call vpon the Lord, who is worthy to be praised: so shall I be saued from mine enemies. I will send up my cry to the Lord, who is to be praised; so will I be made safe from those who are against me. I will call upon Jehovah, who is to be praised: so shall I be saved from mine enemies. 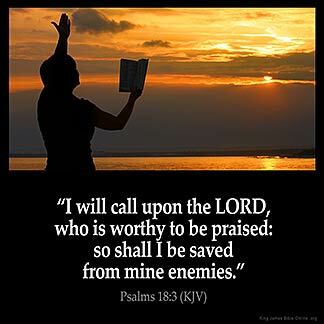 I will call upon the LORD, who is worthy to be praised: so shall I be saved from my enemies. I call on Yahweh, who is worthy to be praised; and I am saved from my enemies. (18:4) Praised, I cry, is the LORD, and I am saved from mine enemies. Frank on 2013, 8 30 You said it exactly right . I agree with you wholeheartedly. When I am in right standing with my Lord I can call upon Him and Praise Him for His great deliverance and I shall be saved from my enemies. The last enemy of mine will be death and then death hath no more dominion over me . Praise God forever more !!!! its a psalm of assurance and trust in the potency of our Lord and God. its a good depiction that God gives the ultimate protection from those who oppose our course. the selective terminology builds in me a sentiment and sobriety that when i choose to surrender to the Most High and depend upon His power, i am placed in that position that He moves in to defend my course and life so that them who oppose my advancement are quitened. its a build up for peace for then He secures my borders.